See scan - perfect condition. This is a nice and rare Bulgarian communist era Merit badge as awarded for technical and technology development merit in the Bulgarian NAVY / marine. The badge is in the form of a large red star with an anchor and a ship's stearing wheel plus the Bulgarian NAVY flag and a military ship at middle. Size is 35mm x 35mm. 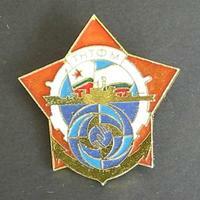 Scarce military / militaria collector piece and one of the rare Bulgarian badges.